The Miller Center for the Arts at Reading Area Community College will host the 11th annual Senior Festival of the Arts (SFA), from Sunday, June 4th through Sunday, June 11th, 2017. A non-juried art show for seniors, the SFA features over 100 works of art in eight categories and a week of free and low-cost events including a film, workshops, performances and a special exhibit of art created by seniors with Alzheimer’s. The festival opens on Sunday, June 4th with a 1:00 p.m. reception, followed by a presentation at 2:00 p.m. featuring senior performers sharing musical and poetry selections. Artists who are participating in the exhibit will also be recognized at this time. The exhibit will be open daily from 12:00 p.m. to 4:00 p.m. with special events featured throughout the week. 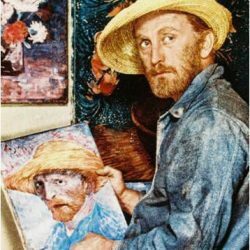 On Tuesday, June 6th, at 1:00pm, seniors (of all skill levels) can participate in a painting workshop led by artist, Amanda Condict, where they will complete a “Main Street” scene of Reading, PA. On Wednesday, June 7th, at 1:00pm, the Academy Award Winning film Lust for Life starring Kirk Douglas will be shown which shares Vincent Van Gogh’s story. On Thursday, June 8th, at 1:00pm, former Berks County Poet Laureate, Nancy Yeager, will lead a poetry workshop where participants will use artwork from the SFA exhibit as their inspiration. The festival will close with a 4:00 p.m. Second Sunday recital by emerging international concert pianist, Vatche Jambazian. The purpose of the SFA is to create an awareness of and support for the artistic talent of seniors in our community. RACC is proud to serve as the primary sponsor of this event along with a host of community sponsors many of whom have supported the event for more than the ten years it has been at RACC. A committee composed of artists, healthcare and senior services providers, and business professionals come together to continue the effort that Nancee Lemmerhart spearheaded nearly 30 years ago. For more information about the Senior Festival of the Arts, or to register for the Painting or Poetry Workshops for Seniors, please call 610.374.4721 x5509 or go to the events page at http://millercenter.racc.edu/ . Admission to the exhibit and film are free. Cost to register for the painting workshop is $15.00. Cost to register for the poetry workshop is $5.00.